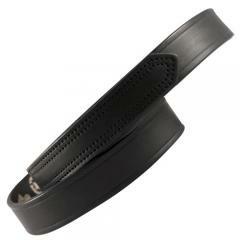 Boston Leather offers belts without buckles. These are great when working on vehicles, or whenever you want to make sure you don't scratch a surface. They are made of the same high standards as their other belts. I love this belt My work requires a scratchless belt but the ones they provide have two hooks, which always come out of the holes during the work day. This one provides a great alternative. It does scratch me a little if I don't wear my shirt tucked in, but other than that, not one complaint. These belts are very nice especially if you have to go thru metal detectors repeatedly during your day.